A universal basic income is best response as capitalism turns on ‘normal people,’ Democratic candidate for president says. 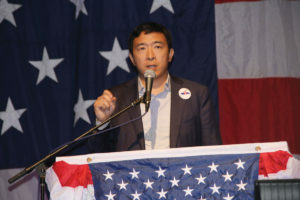 Democratic presidential candidate Andrew Yang, a New York entrepreneur and advocate of a universal basic income, addresses party faithful at the annual Wing Ding, a northern Iowa gathering of Democrats in Clear Lake. Andrew Yang is seeking to shake the very foundation of how Iowans see themselves, how they measure their lives with an expected sense of fairness in day-to-day commerce, a belief that hard work will be rewarded, that old jobs rendered obsolete by the dizzying pace of technology will surely and seamlessly be replaced with new ones — maybe with better pay. This 2020 Democratic presidential candidate, a New York businessman with ties to Silicon Valley, is here in Iowa with what he says are the urgent hard truths from what he’s learned behind the curtain of disruptive technology companies and Big Tech’s scooping and segregating of money and opportunities from rural Iowa and other reaches of the nation to elite California and Boston and New York enclaves. The business world is moving from paper-less to driver-less to, more and more, people-less systems. Jobs once considered secure, even prestigious, are vulnerable to the march of machines, the rise of robots, says this self-described entrepreneur. For most “normal people” — those with Midwestern work ethics and generally middle-class orientations — capitalism as the nation knows it today is turning on them. And fast, says Yang. So Yang, a capitalist with a resume lined with experiences from the go-go days of tech, is pitching an adapted capitalism, one that accepts this: If you think your job is safe from computers, you likely will be wrong — and the challenge, coming at the nation like a runaway freight train (controlled by a computer, not an engineer), is that people need work more than work needs them. “It’s not like if someone tries harder it’s going to be the crucial difference maker of them having a job or not having a job,” Yang said in an interview with CITYVIEW in Clear Lake at Lake Coffee and Ice Cream. Yang’s big idea, and it is one of the biggest to hit a presidential campaign in the modern era: instituting a universal basic income (he calls it a Freedom Dividend) in which all American citizens 18-64 would be paid $1,000 a month. No questions asked on how they spend the money. Yang would pay for it with a 10 percent value-added tax (VAT) on goods and services that would hit people with the most money, buying the most things, the hardest. Companies like Amazon would pay the most into the system, Yang suggests. The universal basic income isn’t designed to fund an American citizens’ full existence, but rather, realign an unfair economy by moving more money from tech enclaves on the coasts to distressed areas of the nation. Iowans could literally get some bites out of Apple. “We have to start owning the reality that technology is advancing in ways that will challenge many of our notions about work and value,” Yang said in the 30-minute conversation. Case in point: Driving a truck is the most popular job in 29 states — and there are 3.5 million truck drivers nationally. Vast numbers of these drivers soon will be out of work as driver-less trucks take their places, Yang said. It comes down to the math: Morgan Stanley estimates automated freight delivery will save $168 billion a year. In protests, angry, out-of-work truck drivers could park their trucks on the highways, jack-knife the rigs, and otherwise turn Interstate 80 and Interstate 95 into impassable parking lots, Yang said. The displays of civil unrest from the truckers could make the women’s marches and #MeToo movement of the Trump era look tame by comparison, Yang said. The average age of a trucker is 49. Most are white men. They live in the South and Midwest — and it is unlikely they can be relocated or be trained to do computer coding in the California corridors of emerging technology, Yang said. It’s not just truckers. Radiologists, for example, will be affected by artificial intelligence as software can identify tumors more accurately than humans, Yang said. “The radiologists went through years and years of training, and again, it’s not like they got less hard-working, it’s just the software got better,” he said. Yang, a son of Taiwanese immigrants, says the people in the nation he most worries about are poor whites. “If you look at the numbers, the suffering is ramping up among parts of the country that have historically not been in that position,” he said. The newness of the economic challenges for many white working people is causing anger and despair, Yang said. “In my mind, most of it is completely justified, that these things are happening to people in communities, that there are forces at work, massive economic and technological forces, that an individual in Iowa or Ohio or Michigan is just doing their job to the best of their ability and they wake up one day, and then the factory closes, or pretty soon, the truck just starts driving itself,” Yang said. So where should middle-class Americans direct their anger? At government for being decades behind the curve about what automation is going to do to millions of jobs and careers, Yang said. “In a representative democracy, there’s absolutely no reason that our government should have let communities get blasted to smithereens by economic forces that advantage some people and clearly did not advantage others,” he said. Douglas Burns is a fourth-generation Iowa newspaperman. He and his family own and publish newspapers in Carroll, Jefferson and other neighboring communities.